I have finished the last of the green fusion merino. It’s plied, soaked, and almost dry now. My desire to make it thicker worked, but I won’t do the WPI and know how much until it’s dry. I think I will also do a grist comparison between this and previous skeins. Say what? Grist is a measurement of density. Basically its pounds-per-inch. Along with WPI, it’s useful information about your yarn. I had to think some about what to spin next. I decided on a merino-silk blend that I did a quick sample of a few weeks ago, it makes a stripey barber-pole type effect in the singles and has a tweedy look when you knit it. The sample I did before kind of “greyed” out to the eye – in other words, a lot of the color variation blended to look grey. Like with the merino, I’m deliberately spinning this thicker, so I’ll be interested to see of that makes a difference in the knitted result. 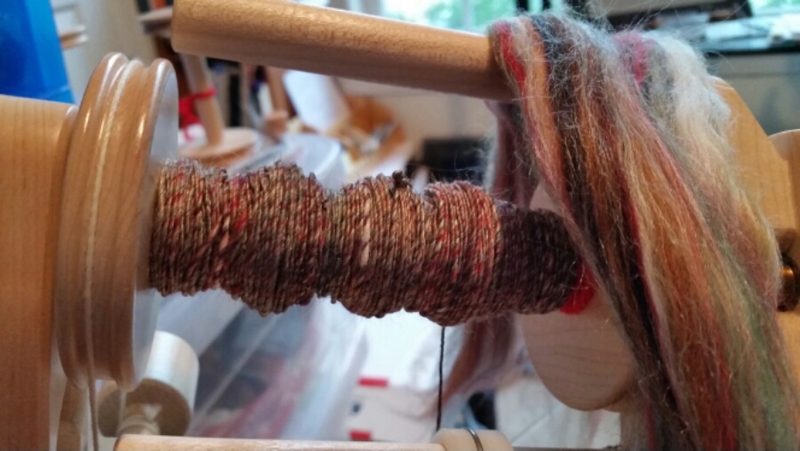 You can see the stripes in the roving and in the spun singles on the bobbin here. This entry was posted in Art, Fiber and tagged Arts, beginnings, creativity, Merino, Merino-silk Blend, Spinning. Bookmark the permalink.